← Driving: Lawyers, reporters and crackheads, oh my. When NBC and Fox announced their ‘me too’ online video joint venture, Hulu, I was understandably skeptical. After all, Joost had already launched to much fanfare with top partners like Viacom’s MTV and Turner’s Cartoon Network. YouTube had quite a niche already, and I satisfied all my TV time-shifting needs via BitTorrent. “What would the big ol’ networks know about online video?” I thought. Evidently, they know quite a bit. Unlike the record industry’s litigious reaction to music downloads, Hulu is now a shining star of acceptance and business model revolution on the part of the TV industry. Bravo! Boy, did Hulu get it right. Why did millions of folks download TV illegally? (And why do people still download music illegally?) Because it was cheaper and easier than ‘purchasing’ the legit product, traditional TV. Traditional TV is annoying — you have to sit in front of a box in your living room at a specific time and 1/3 of the time you’re sitting through ads. Hulu tipped the scales just far enough to make high quality, instant streaming video of premium TV shows available to end-users. It is significantly more convenient than BitTorrent, which required 1-2 days of turtle-speed downloading, and it’s legal. AND, it’s even better than regular TV! While traditional TV ads drive me crazy (four minutes of ads per break is excessive), Hulu maxes out with at most four ads over the entire length of the video. And, of course, I can watch Hulu content whenever I want. Now, Hulu just hammered the final nail by offering recent episodes of the Daily Show and the Colbert Report. 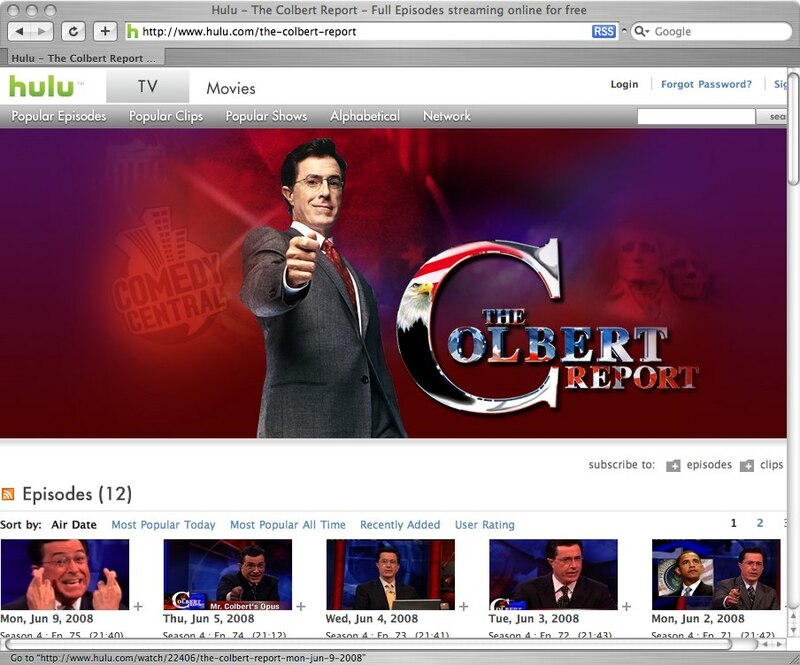 With Colbert, Daily Show, The Office, Simpsons and the Family Guy, Hulu proves content is king. I’m a believer. Joost required a proprietary, closed-source client (a la Skype per their founders), a step that turned off many users and just plain excluded many — no Linux or Mac PowerPC Joost client has been ever released. Hulu is open, not platform dependent and requires nothing more than a browser with a recent version of Flash. Joost’s content sucked. Which is a bit odd, especially considering their prime partners like Viacom and Turner. Funny that NBC/Fox’s Hulu was able to score Viacom owned Daily Show/Colbert content, even though Viacom is an investor in Joost. That should tell us something. This entry was posted in internets, media and tagged bay, bit, bittorrent, cartoon, colbert, daily, distribution, download, downloading, fox, hulu, hulu.com, illegal, joost, mtv, nbc, network, office, old, online, piracy, pirate, piratebay, report, shifting, show, the colbert report, the daily show, time, time-shifting, torrent, turner, tv, viacom, video, youtube. Bookmark the permalink. 2 Responses to With Daily Show and Colbert, Hulu takes the trophy. Joost dead? I looooove Hulu. It’s going to be interesting to see what happens to cable providers like Comcast, because if Hulu keeps growing, cable providers are unnecessary middlemen about to be downsized. I’m getting way more value out of Hulu (free) and my Netflix subscription ($10/month) than I am out of Comcast ($55ish/month for basic cable!). Do you think that there’s a way that they might try to monetize the experience?